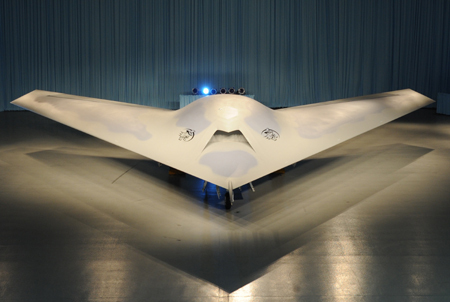 ST. LOUIS, May 10, 2010 -- The Boeing Company [NYSE: BA] today unveiled the fighter-sized Phantom Ray unmanned airborne system, a test bed for advanced technologies. Phantom Ray is scheduled to begin taxi tests this summer. The first flight in December will be followed by up to nine additional flights over approximately six months. Phantom Ray is designed to support potential missions that may include intelligence, surveillance and reconnaissance; suppression of enemy air defenses; electronic attack; strike; and autonomous aerial refueling. “The initial flights will take Phantom Ray through its paces for the flight test profile. Beyond that, the missions and systems tested will be determined by future warfighter needs,” said Craig Brown, Phantom Ray program manager for Boeing. Phantom Ray, which evolved from the X-45C program, is one of several programs in the Phantom Works division of Boeing Defense, Space & Security. Phantom Works uses rapid prototyping initiatives to design, develop and build advanced aircraft and then demonstrate their capabilities. Key Phantom Ray suppliers include General Electric-Aviation (propulsion and power distribution), Honeywell (brake system), Woodward-HRT (flight control actuation system), Crane Hydro-Aire (brake controls) and Heroux-Devtek (landing gear). For a feature story on today’s Phantom Ray ceremony in St. Louis, visit http://bit.ly/99AvLS. Phantom Ray b-roll video is available to news media through the contacts listed below.